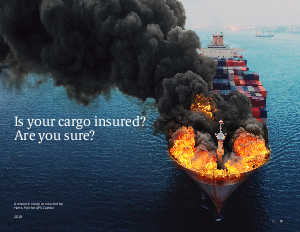 > UPS Capital > Is Your Cargo Insured? Are You Sure? Commerce today involves an increasingly complicated supply chain ecosystem. Companies rely on suppliers and buyers across the globe, most of whom they’ve never met. They use multiple carriers and modes of transportation, across international borders, with different languages, currencies and laws. This ever-changing landscape means that companies of all sizes must be more diligent than ever when it comes to managing their supply chain — and their risk. In addition, e-commerce has revolutionized purchase behaviors, creating loftier customer expectations, and putting increased pressure on sellers to find new ways to meet those needs. Global networks and tight time constraints can amplify the impact from unpredictable events, like theft, damage, weather and natural disasters. This puts even more pressure on a company’s supply chain, and its bottom line. To better understand these issues, UPS Capital® commissioned Harris Poll to conduct research into the attitudes and behaviors of U.S. business professionals (referred to as “shippers” throughout) responsible for their company’s shipments. The objectives were to better understand how shippers viewed and managed risk and their comprehension, and usage of, available risk mitigation tools.